In Paradigma, we not only lead the digital transformation of large companies, we've also been creating innovative digital specialized products for the mobile sector for years. 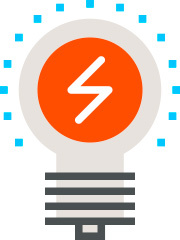 Since 2017, we have helped mobile operators around the world to create second, low cost brands, which offer a unique user experience and integrate all the technological infrastructure of an operator while reducing operating costs thanks, in large part, to the use of technology. 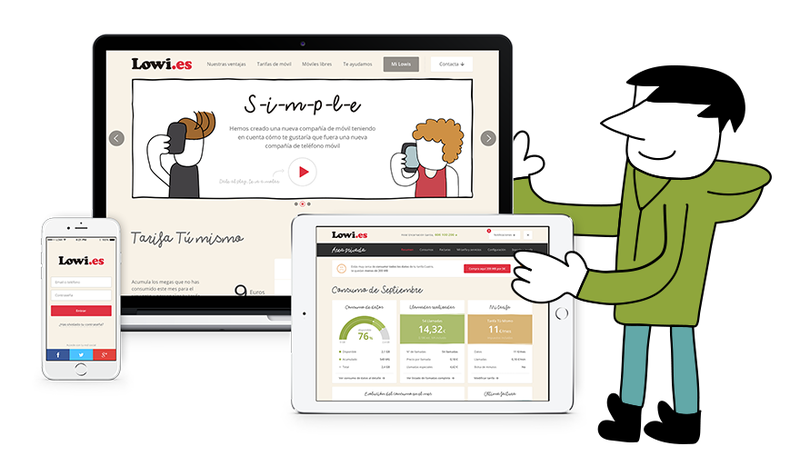 We have created omnichannel experiences thanks to web applications, integrations, and mobile applications that facilitate the way in which millions of people interact with their mobile operator on a daily basis. Our customers include cases of success such as Lowi, Simyo or Tuenti (from Spain to Argentina, Ecuador and Peru). 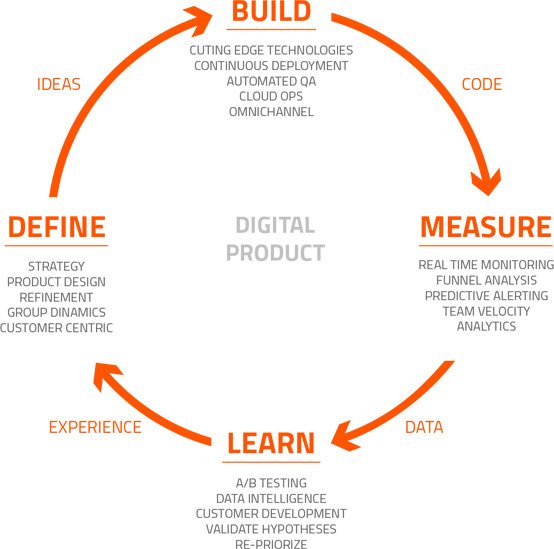 Digital Transformation, Digital Strategy, Cloud, Digital Products design, Customer Centric, Omnichannel, Customer Experience, Scrum. We started our journey creating Simyo Spain's website. Simyo was born with a 100% digital strategy, offering a personal area that had the ability to manage virtually all of the user’s needs without having to contact the call-center. Customers loved this strategy, and it became their main sales, information and management nexus. Even shortly after birth, Simyo's site was recognized as one of the best web sites in the past few years. Due to Simyo’s success, KPN decided to partner with us to create a whole series of MVNOs for several brands: Blau, 40movil, movildirecto, vuelingmovil, etc. Solutions were developed for eight different MVNO's, repeating the initial, succesful model. 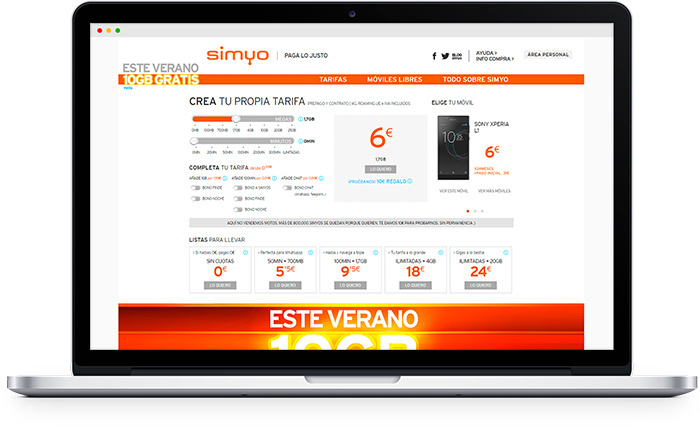 Currently, Simyo has more than 800,000 customers in Spain, serviced by an application ecosystem: online store, eCare, administration, sales outlets, etc. After more than 9 years, Simyo remains confident in our work to evolve their business and develop differentiating digital solutions. Thanks to our work in Simyo, Telefónica trusted us to create their second brand in Latin America. To meet their needs, we built a platform with which to manage the operators of several countries allowing for the particularities each one of them required. This created a global solution capable of providing a degree of adaptation suitable to the needs of each market. We bring our know-how to the design of their web applications, focusing on the conversion and the reduction of customer service costs. In addition, to increase user engagement, a social platform was created, so users could do anything from seeing and answering questions about the service to sharing their experiences. On the other hand, to achieve a great resource efficiency and high availability of the platform, which could respond to the traffic spikes caused by campaigns in each of the countries, we designed an autoscalable Cloud infrastructure on Amazon Web Services. 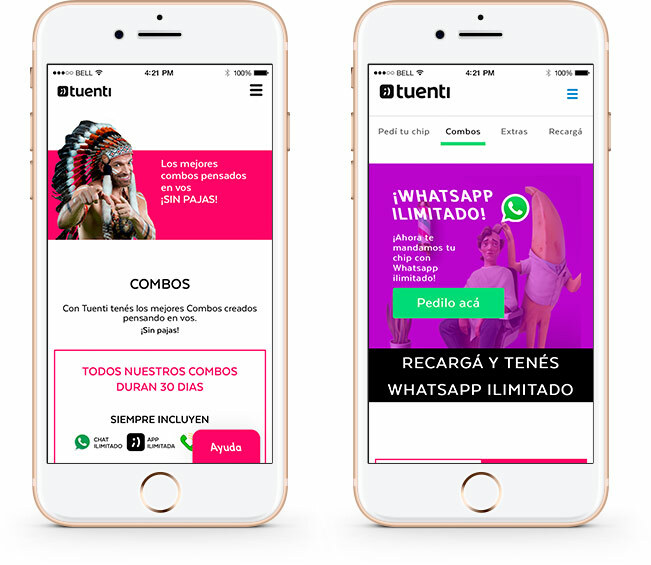 Currently we continue to develop Tuenti's digital business. Our platform now supports the operations of 5 countries. 10,000 new customers in the first 6 weeks, currently more than 200,000. Lowi posed the challenge to create a new mobile operator from scratch with some very aggressive deadlines, in a record time of just 12 weeks. Having such demanding deadlines and ensuring a successful launch is only viable through a minimum viable product (MVP) strategy with which to offer Lowi customers a complete and omnichannel experience. We worked hand in hand in the construction of a store and customer eCare portal, mobile applications, we developed a management solution for the call-center and applications for physical sales outlets and implemented an integration platform capable of grouping all the necessary processes to be able to offer a 100% digital solution. Currently, our agile team, supported by Cloud techologies, keeps Lowi with a low time-to-market that allows any change to go from conceptualization to production in two weeks, including design, front and back development and QA. Three years after launch, Lowi has 200,000 customers and was named best OMV in 2015 and 2016 by ADSLZone. A traditional analysis of requirements does not work in a constantly changing environment like the one that surrounds MVNOs. Therefore, we were looking for a more effective and practical way to work in product design, based on group dynamics and highly visual deliverables; based on the agile and always trying to exploit the competitive advantages that the latest technological trends bring. Group dynamics are therefore the key point in our digital strategy projects and the creation of MVNOs; we use them from the conceptualization of ideas to the organization and prioritization of the functionalities that provide the user with a greater value. operators and how they perceive their services, thus creating a differential experience that provides added value. Without forgetting to incorporate into the digital strategy SEO and analytics, which allow us to optimize funnels of purchase through test A/B, upselling systems and devising creative solutions that have allowed our customers to improve their ARPU. We are constantly incorporating the latest technologies into our projects, taking advantage of everything that may allow us to generate a greater business value for our customers. One of the innovations that we are implementing for mobile operators is our Cloud microservice infrastructure. 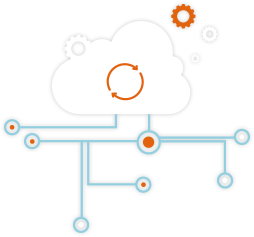 This Cloud infrastructure allows us to develop solutions that maximize the availability of the services offered to the customer and cut down operating costs. On the other hand, communication with third party services is particularly complex for mobile operators. Through isolating modules of functionality in microservices, we have made it so that any failure in the third-party systems integrated in the platform will have a limited impact while allowing the rest of the services to operate optimally, ensuring that the rest of the business processes will not be affected. Paradigma offers 360 solutions for MVNOs, from inception to implementation and support. To achieve this, multidisciplinary agile teams are created, with specialists in every area that provide web development, UX, SEO and web and mobile analytics, system implementation, front-end management, native mobile applications and back-end integration. Our know-how of the operation of the mobile operators and our experience building MVNOs make us the best strategic partner for mobile operators worldwide.